As published in our previous Virtual Income Scam Review, we have concluded that this deceitful piece of trash is a fraudulent software, Autotrader, and APP that will intentionally take losing trades and deplete your balance in a very effective and efficient manner. Furthermore, despite our attempts to reach a peaceful resolution, we are constantly being pressured to modify our reviews. We remain steadfast and resolute in regards to our decision to shed light on this particularly heinous binary options investment scam. We remain faithful to our initial premise of providing valid and documented proof of fraudulent trading systems whenever these may appear, such as this clear-cut case previously investigated here at Binary Scam Alerts. As they say “The Devil is in the Details”, so we combed through the terms and conditions section and found some outrageous legal clauses that really gave us an added legal dimension and allowed us to see how these crooks protect themselves from legal persecution and hide behind the flimsy veil of the so-called “terms and conditions”. This is basically saying something like “We are going to scam you any way we want, and there’s not much you can do about it.” Well Mr. Cheater, I beg to differ and it’s time we shed some light on your shady little operation. 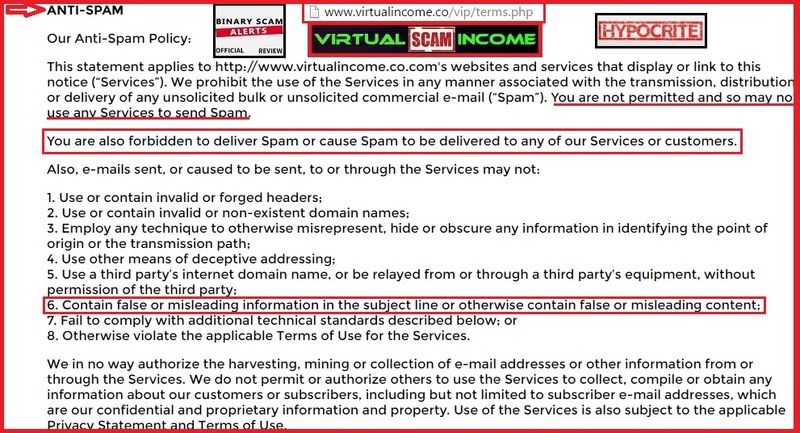 The image bellow is a screenshot of the Virtual Income “Anti-Spam” policy, and is a reflection of the modus operandi these two-faced cyber-hoodlums have adopted. It’s no secret that most traders are being contacted via SPAM Email marketing tactics and that this is how the majority of the day traders are being enticed or lured into joining this parade of injustice and deception. Yet contrarily, these evil people are saying listen you’re not allowed to do that. You are also not allowed to use “false or misleading information”, but that’s what this whole gig is about! Our staff and researchers also stumbled into the Limitation on Liability clause. For those of you who are not familiar with the legal term, it basically means that they can’t be held accountable for any damages done to customers who “lose revenue or income” or “suffer emotional distress” as a result of getting defrauded by this fake app. 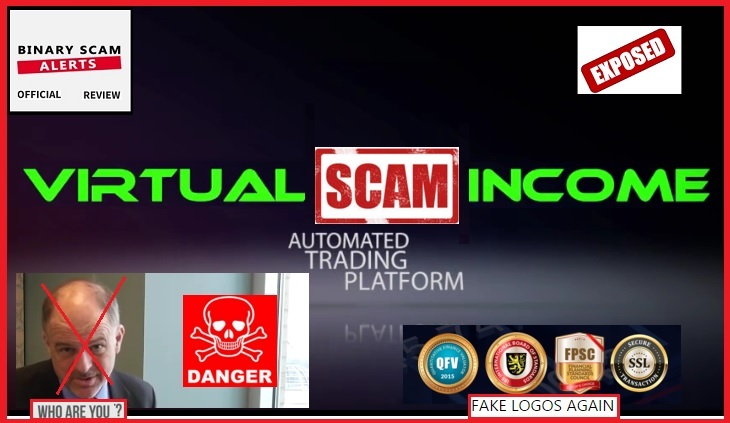 The Virtual Income Scam is a highly deceptive binary options scam which employs advanced technological tools such as Java Script widgets and PHP coding in order to manipulate the facts and lure innocent day traders into a web of lies and misery. Everything about this system answers to the criteria of SCAM and FRAUD. We have no real person who identifies himself, not to mention no public social profile. There is no local (or for that matter any) legal business entity that can be held responsible for any punitive damages as a result of losses incurred by customers. The use of phony profit calculators is a cheap and rehearsed gimmick, and the use of photo-shopped images from an image bank is clearly evident. There is no software to be seen, as everything is very secretive and obscure. In short, we are looking at a Class A Scam, and you must be totally aware of what you are getting into. If you believe you are about to make money trading binary options with this fake system, your are either blind or in complete denial. You can forget about technical analysis, scalping, trading the news, or candlestick charts. There is no way in hell you can achieve a 90% ITM ratio, unless you are trading on a demo account or some fake review is showing you inflated figures. In short, your primary concern needs to shift from making money to recovering your losses in the cleanest and most effective way. Yes, however as is the case with most of these scams – you must fund a trading account with a recommended broker in order to qualify. The initial investment amount is usually no less than $250. These include but are not restricted to My First Online Payday, Trade X Confidential, Limitless Profits, Trade Tracker Pro, Binary App 810, the Amissio Formula, Tauribot, Citidel, Push Money App, Centument, Insured Profits with Dave and Ginny, Millionaire’s Blueprint, Binary Matrix Pro, and The Free Money System with Walter Green. There is a plethora of systems out there in various forms. Some are signals, others are bots, copiers, or Autotraders. 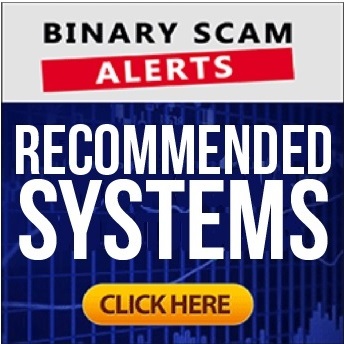 Binary Scam Alerts endorses the Binary Profit Method in the signals category. If you are interested in an Auto-trader please make sure to check out our Virtnext Review. The Virtual Income Software is a SCAM Autotrader and APP. The owners of this software are professional con artists and high tech swindlers, they will fleece your wallet and send you on your merry way without a hint of guilt or remorse and then share their spoils with greedy offshore and unregulated brokers. We encourage our members and subscribers to stay far away from this fraudulent system. As always, we invite you to join our Facebook group and Subscribe to our YouTube Channel.